The Louvre’s Petite Galerie - a space set aside for art and cultural education- is launching a new exhibition on September 26, 2018. The event is intended to spark a dialogue between archaeology and this season’s “guest” - comic book art. 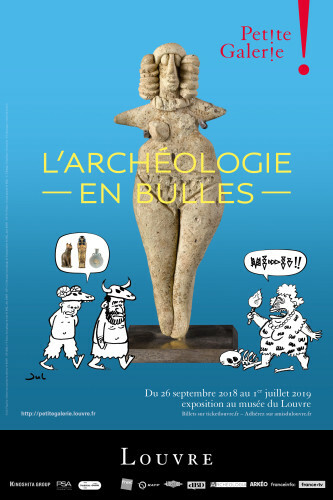 About a hundred artworks and a selection of original pages by comic book artists with an interest in archaeology (such as Jul, Enki Bilal, and Nicolas de Crécy) will invite visitors to follow in the footsteps of amateur and professional archaeologists with a passion for antiquity: to see how they discover “treasures,” unearth objects buried at different periods, classify them, and try to understand what they tell us about the past. – “Artists and Archaeologists”: archaeology did not become a profession until the 19th century, when scientific archaeologists began to use drawings, surveys, and publications. Both archaeologists and comic book artists use sketchbooks to record the objects, places, and characters that interest them―but comic book heroes tend to be reporters, detectives, or adventurers rather than scientists! – “Archaeological Treasures”: the history of archaeology is dotted with amazing and unexpected discoveries. But the word “treasure” has a particular meaning for archaeologists: it can refer to pieces of precious metalwork that were buried to save them from natural disasters or war; it can also mean a group of objects dedicated to a divinity and buried under the foundations of a temple, in the ancient Near East and pharaonic Egypt for example. Many comic books feature these moments of discovery―unexpected or otherwise―with heroes in search of treasure or lost civilizations. – “Classifying and Understanding”: using methods of description and comparison derived from natural science, archaeologists identify, classify, and suggest typologies of material according to technique, shape, or decoration. To date an artifact, they study the conditions of its discovery (burial depth, traces of destruction, etc.) and try to relate these to known events. Some comic book artists use the thoughts of their heroes to evoke different periods of the past; others compose their own typologies of objects. – “Interpreting and Imagining” and “Comic Book Creativity”: after excavations, archaeologists study and publish their finds. They gather all the material data available and try to interpret it. When there is no information about the context in which an archaeological artifact was found, it is difficult to interpret it. Comic book art has drawn inspiration from historical figures and legendary heroes, archaeological sites and imaginary places. Historical accuracy is sometimes respected, but fact usually gives way to fiction or even science fiction. Educational wall labels, video displays, a digital flip-book, and a media library draw attention to details and provide key contextual elements. The Petite Galerie App (French only), designed for visitors with disabilities, can be downloaded free on iOS and Android. L’archéologie en bulles, under the direction of Fabrice Douar and Jean-Luc Martinez, assisted by Florence Dinet. Co-published by: Musée du Louvre Éditions / Éditions du Seuil. French. Family tours (ages 8 and up, French only) every Saturday at 2:30 p.m.
October 24, 25, and 26, 2018. October 10, 2018, January 13, and March 13, 2019, at 8 p.m. Screening for younger audiences on Thursday February 28, at 3 p.m.
October 3, 2018 at 12:30 p.m.
November 21, 2018, January 13, and April 3, 2019, at 7 p.m.
Three discussion sessions on the theme of archaeology and comic book art for anyone interested in improving their general knowledge. With Ali Rebeihi, journalist and producer at France Inter (French radio station). October 11, 2018 at 7 p.m.
book artist Enki Bilal will discuss their views of Egypt.